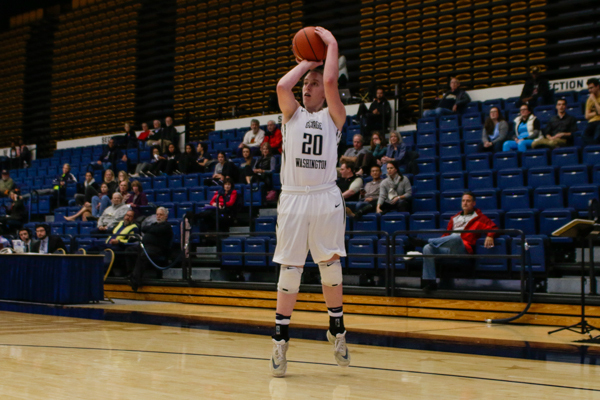 Senior Hannah Schaible takes a jump shot in GW's win against Coppin State. After women’s basketball suffered a disappointing loss to Georgetown in their season opener, first-year head coach Jennifer Rizzotti told her players to “trust the process” in the face of early adversity. Now, seven games into the season, the phrase has become a mantra for the surging team. The Colonials have won five of their last six games and now sit at 5-2 – the second-best overall record in the Atlantic 10. That stretch included a 2-1, fifth-place finish in the Gulf Coast Showcase in Estero, Fla. last weekend. Across the back-to-back-to-back games, Rizzotti said she saw the progress her team has made since sacrificing an 11-point lead against the Hoyas earlier this month. Depth and veteran frontcourt experience have been strengths early on for the Colonials, who are led by Preseason All-Conference First Team center Caira Washington. After averaging 13.6 points, 8.3 rebounds and 1.3 blocks per game last week, the senior was tabbed A-10 Co-Player of the Week on Monday. In the first game of the Gulf Coast Showcase, Washington posted her second straight double double, notching 13 points and 11 rebounds, to help the Colonials roar back from a 20-point first-half deficit. However, the Colonials were unable to overcome 23 turnovers against nationally ranked Syracuse, whose stars Alexis Peterson and Brittney Sykes took advantage on the fast-break. Key contributions by graduate transfer Lexi Martins and junior forward Kelli Prange have also helped to bolster GW’s strong post-play through the first seven games. Martins, who is averaging 8 points and 6.4 rebounds per game in 19.3 minutes off the bench, has met expectations in her reserve role. Her impressive rebounding, which ranked third in the nation last year, helped the Colonials out-battle their opponents on the boards by an average margin of 14 rebounds per game over the three-game stretch. GW’s advantage on the glass led to second-chance opportunities, another category in which the Colonials have been able to capitalize on with their size in the post, outscoring opponents 53-27 in that category over their past three contests. Despite early-season success in the paint, however, losing star center Jonquel Jones and point guard Lauren Chase last spring left the team without an experienced point guard and vocal floor general. Consequently, Rizzotti managed the point guard position by committee through the first four games this season. But following the hard-fought loss to Syracuse Friday, Rizzotti found the vocal leader she had been looking for by inserting combo-guard Mei-Lyn Bautista into the starting lineup. The sophomore, who had six points, three assists and four rebounds in the loss to the Orange, answered the call. Over the next two games – both blowout victories – Bautista helped to pick up the pace of the offense, tallying a total of nine assists, five rebounds, and two steals. After a 76–47 rout of Florida Gulf Coast on Saturday, Rizzotti had high praise for her new point guard. Although Bautista has helped set the pace for the Colonials’ offense, Rizzotti has looked to her bench to maintain leads and keep her starters fresh. In the three-game roadtrip, no player averaged more than 25 minutes per game, and the Colonials’ bench outscored their opponents’ benches by an average margin of 11.7 points per game. After blowing out Florida Gulf-Coast on Saturday in a game that saw ten different Colonials score, GW defeated Western Kentucky, 68-49, in the fifth-place game on Sunday. The bench, led by Martins and junior guard Mia Farmer, who had 7 points, scored 29 points and shot 50 percent from the field in another strong performance. GW will look to extend its two-game winning streak on Friday when it plays host to A-10 rival VCU.